Καλοτοποθετημένο στη νυχτερινή διασκέδαση, ψώνια, εστιατόρια περιοχή της Μπανγκόκ πόλης, το Kokotel Surawong Bangkok είναι το κατάλληλο μέρος για να χαλαρώσετε από τις πολυάσχολες μέρες σας. Μόνο 38km μακριά, αυτό το 3 αστέρων ξενοδοχείο είναι εύκολα προσβάσιμο από το αεροδρόμιο. Με την βολική του τοποθεσία, το ξενοδοχείο προσφέρει εύκολη πρόσβαση στους προορισμούς της πόλης που πρέπει οπωσδήποτε να δείτε. Στο Kokotel Surawong Bangkok, πραγματοποιείται κάθε προσπάθεια για να αισθανθούν άνετα οι επισκέπτες. Για να το πετύχει αυτό, το ξενοδοχείο προσφέρει τις καλύτερες υπηρεσίες και ανέσεις. Για να ονομάσουμε μόνο λίγες από τις εγκαταστάσεις του ξενοδοχείου, υπάρχουν τα δωρεάν WiFi σε όλα τα δωμάτια, 24ωρη φύλαξη, ημερήσιος καθαρισμός, αυτόματο πλυντήριο, υπηρεσία ταξί. Οι πελάτες μπορούν να επιλέξουν από 40 δωμάτια καθώς όλα διαθέτουν μια ατμόσφαιρα απόλυτης αρμονίας και γαλήνης. Εξάλλου, το ξενοδοχείο διοργανώνει πολλά ψυχαγωγικά δρώμενα έτσι ώστε να έχετε πολλά πράγματα να κάνετε κατά τη διαμονή σας. Όταν ψάχνετε για ένα άνετο και βολικό μέρος για να μείνετε στη Μπανγκόκ,το Kokotel Surawong Bangkok γίνεται το σπίτι σας μακριά από το σπίτι σας. Cut short my stay over at a nearby hostel due to it's unbearable noise level and decided to give Kokotel a try and I am impressed with the overall experience here.The friendly staff interact well with good understanding of spoken English. The room is clean, tidy and spacious. Aircon is working well and equipped with fridge, TV, hair blower, safe, power points, wardrobe, table lamp. Most importantly it's quiet and calm hence I slept like a baby ! Kokotel is located within walking distance to saladaeng and chong nonsi Station so a nice 10 min walk is all it takes. Several convenient stores and loca eateries nearby too. I will not hesitate to check in with Kokotel again and I recommend them if you're looking for good value for money stays.Once again a big thumbs-up to Kokotel and all the friendly staff keep up the good work ! Dear Leow, First of all, thank you very much for choosing to stay with us at Kokotel Bangkok Surawong Bangkok. We appreciate for taking your time-sharing experience during your stay with us. I will pass your compliment regarding staff service especially Front desk to keep continue providing quality and friendly service to our guest. Our hotel location is near shopping mall, BTS Skytrain, 7-11, Night Market. Our 4Sher restaurant and café serving variety of food breakfast, lunch and dinner, ranging from Thai dishes, Japanese dishes and Western in the hotel. and happy hour 17.00 - 20.00 every day buy 2 get 1 free for Beer. For your future trip to Thailand, if you would like to explore other destinations, I would like to let you that Kokotel has other properties within Thailand such as 1. Kokotel Chiang Mai Nimman 2. Kokotel Phuket Patong 3. Kokotel Krabi Ao-Nang 4. Kokotel Krabi Oasis. Please feel free to contact me for reservation assistant. Hotel provide playground for kids, is fun for kids to spend some time there. Our room have double decker bed, is very dusty for upper level of the bed, we didn’t request to change as the moment we want sleep is late. The staffs are fantastic and they are more than willing to assist whenever we need them. Cons: perhaps the Housekeeping can be improved in the future as when we checked in on the first day and found out there are some incomplete stuffs such as towel is on the floor, body shampoo is not being refilled prior to the previous customers stayed. Me and family stayed here for few days, and it was average. But absolutely good value, for what it provided. Clean room, comfortable bed, accomodating staff. What more can you ask for? My only complain will be it location, q a distance from the city center but it wasn't very far. Dear Norman, Thank you very much for choosing to stay with us at Kokotel Bangkok Surawong. We are delighted to hear that our facilities & service reached your satisfaction. We hope to welcome you back with us in the near future. Could see dust in the air, not just a little but a lot. Room is too small for 3 persons, we can barely move around at the same time. You can find more spacious rooms in bkk with this price. However the slide and play room are good for kids. 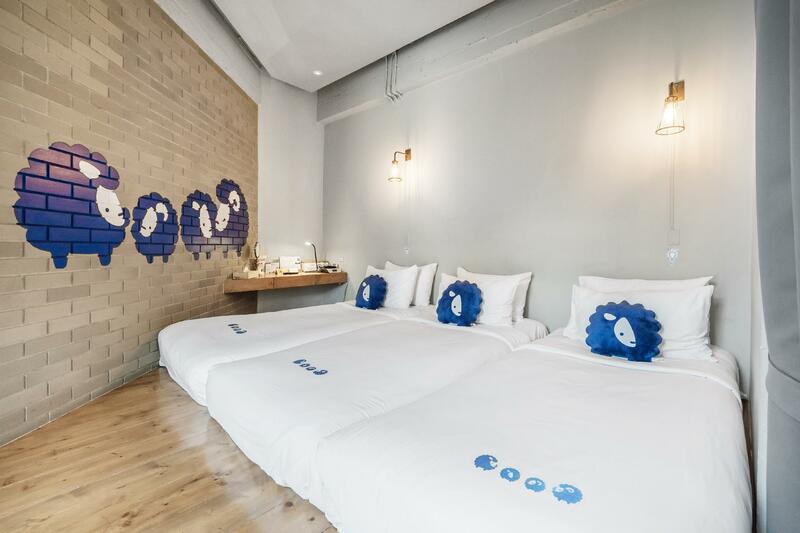 Kokotel is one of those Bangkok themed hotels that is very artsy, cozy, and kid friendly. Love how everything in the hotel is customized- it's branding is on point especially for young travellers. I must say it's very instagrammable. Staff, too, are nice and easy to talk with. The only downside for this hotel is its location. It's nowhere near the trains which is very hassle for tourists. Dear Pattricia, Thank you for providing valuable feedback in regards to your stay. While we are satisfied in knowing you had many positive experience during your stay. I passed these comments on to the team who were delighted to learn that you enjoyed such a pleasant stay. We hope you will continue to stay with us on future trips and we look forward to welcoming you back very soon. the problem for me is the location was too far from bts/mrt (it can solve by grab) and no kettle in the room. i choose this hotel because it close to Assumption Cathedral about 1km from here, they have playing room for kids, me and my boy enjoy play sliding from 2nd floor to 1st floor, room was good enough but it was too small for 3 people. but i really recommend this hotel if you don't mind with location. Dear Grace, First of all, thank you very much for staying with us at Kokotel Bangkok Surawong. We are really glad to hear that our facilities made your visit pleasant. We would like to apologize for the inconvenience basically we do have kettle for the guests you can request from our front desk we do provide you anytime. Thank you again for your feedback, we hope to welcome you back to our hotel in the near future. It is one of the best budget hotels my friends and i have stayed at. The hotel made the ambiance so fun! The rooms are clean and it's location is very convenient for taxis, and there's also a 7/11 nearby for late night cravings. Dear Prizzila, Thank you very much for the valuable feedback and even more for hearing that you enjoyed a pleasant stay with us at Kokotel Bangkok Surawong. We greatly appreciate the encouraging comments made in your precious review as well as providing us details of your positive experiences. We do hope you will choose Kokotel once again, and I look forward to welcoming you back for another wonderful visit. Biggest attraction is the slides from 2nd floor to 1st floor which can withstand up to 90kgs. Which adults are eligible to play!!! You will like this place and I really wish to spend more days over here. Quite and cosy more important clean and close to local foods n 7-Eleven store. BTS is about 10 mins slow walk away. Grab will solve these issues no worry. Toilet is abit small with door too close to bowl when in sitting position not too sure abt other rooms too. Overall stay uneventful and pleasant. Kokotel is by far the cutest hotel I have ever stayed at in my life so far. 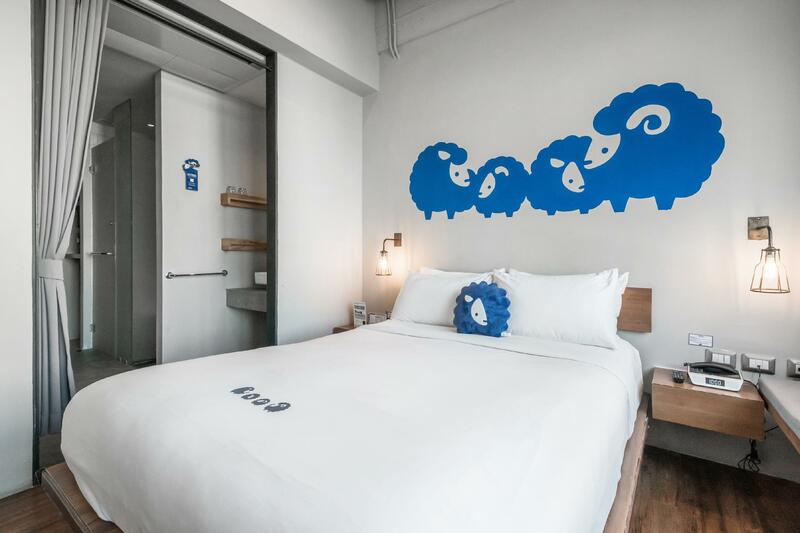 From afar, you can already see the signature sheep icon, and when you entire, giant stuffed ones welcome you by the door. 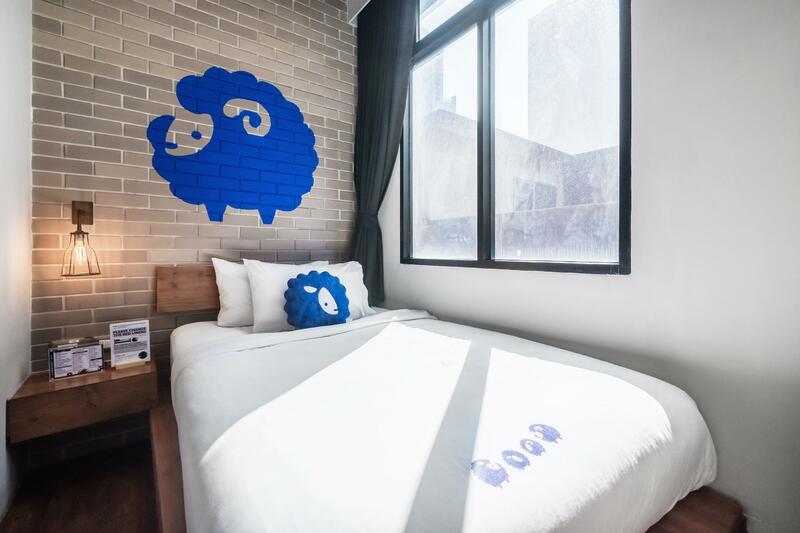 Our room also had a cute sheep throw pillow and was large enough for the 3 of us to move around with our luggages. The staff are also very hospitable as I have availed of a luggage transfer service with them while I stay overnight at Hua Hin, and the transaction was smooth. No fuss and we’re genuinely happy to help me. There’s also a 7 Eleven nearby for any cravings and needs one may have. In the morning, there’s also a couple of street vendors selling coffee and food, perfect for breakfast. I would definitely come stay here again, and at any of their other branches. You can also check their Facebook page for other promotions! I can’t rememver how many times I stay in this hotel however it still let me have the happy feeling when step in the room. Although the hotel is abit far from BTS however it not important as most the time is taking Grab Car since cheap price. My friends is very happy to stay here. We had good, restful nights in this hotel. Very friendly staff. Close to street food and high quality restaurants too. Would definitely stay here again. The hotel has personality and the room has everything you need for a comfortable stay. The staff was friendly and helpful, and the WIFI and TV were both good. The lighting in the room, specifically by the sink and closet, could have been brighter. It was hard to shave with such dim lights. Also, the rooms are not soundproof so you hear your neighbors, but there wasn't really any street noise. Dear Brent, First of all, I would like to thank you for choosing to stay with us at Kokotel Bangkok Surawong Bangkok. Especially, we are glad to hear that our facilities made your visit. Our hotel concept is Friends and Family all staffs were trained and ready to service all our guests to made their visit. Regarding noise disturbance your feedback is valuable to us. It’s a great opportunity to further improve. Thank you very much for your time for review. We hope that we will be able to welcome you back again in the near future. Very comfortable room and hotel. Staffs are all helpful and friendly.The only concern was the distance from hotel to bts a bit far,about 15 mins walking distance,but somboon seafood restaurant just nearby.The rest was great,definitely will come back again. It is good for family with young children. They have kids clup and cafe for parent. A bit far from skytrain like 5 -10 mins walk. we have always take tuk tuk to Saladang staion for our convenient and it cost 50-60 baht. staffs are very nice. our ropm is located on 5th floor and it could hear noisy from the road. 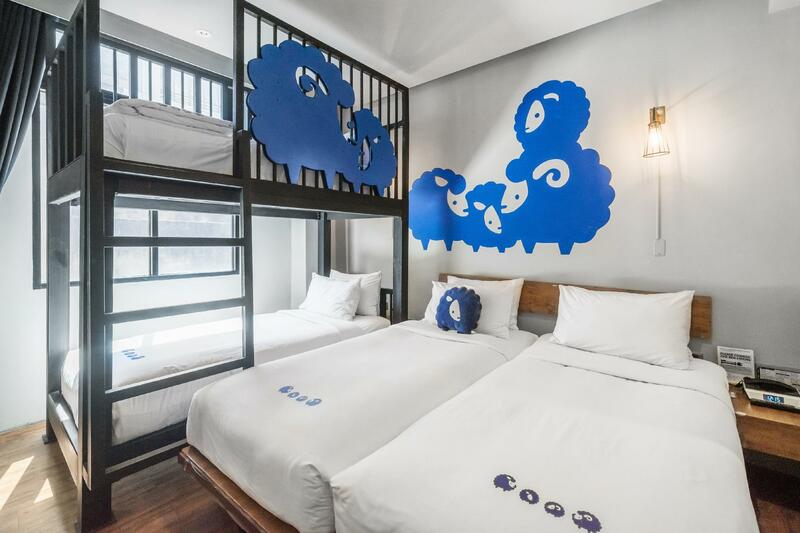 The theme of this hotel is very cute and looks more like for kids but when check into the rooms, the lights are too dim. It's good for couple but not for kids who are afraid of dark, basically not bright enough. Rooms are clean, tidy and comfortable to rest in. Locations wise not very convenient but excessible by tutu or taxi. Customer service is good. Situated more like near a CBD area. Value for money. Σταθμός BTS Chong Nonsi στα 0.68 χλμ.